The UK public favours tackling the ballooning public deficit with cuts in spending, a BBC poll suggests. The survey found 59% of the 1,005 people polled believed there should be benefit or tax credit cuts - rather than tax hikes - to lower the deficit. Almost half of those surveyed (48%) also thought there should be a one-year pay freeze for the public sector. The UK, which now has overall debt of £825bn, is set to borrow a record £175bn over the next two years. 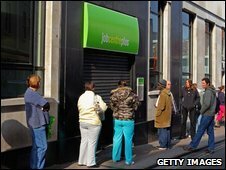 The deficit has ballooned as the UK has entered its longest recession since the Great Depression and has had to bail out several of its largest banks. The poll, conducted by GfK NOP, asked what the public thinks should be done to tackle the deficit. Forty-eight percent of those surveyed are in favour of pay freeze for all public sector workers except military, while 31% want a two-year freeze. A majority favour the highest earning 10% in the public sector taking a 5% pay cut. The Labour government has recommended a pay freeze for 40,000 senior public servants in 2010/11. That would reverse an expected pay increase for GPs, judges, NHS managers and the heads of quangos. But it does not affect teachers, nurses and police officers. Meanwhile, the Conservatives have proposed a public sector pay freeze in 2011 for public workers earning more than £18,00 and frontline military, ending Child Trust Funds for all but the poorest families and stopping tax credits for families earning more than £50,000. The shadow chancellor George Osborne has said that will save £7bn a year over the life of the next Parliament. Forty-four percent agree with Tory view that the UK should not delay cutting the deficit, while 38% agree with Labour that it's too risky for the economy to lower borrowing now. The poll showed 63% wanted to protect the NHS from cuts, rising to support of 71% from over-65 year olds.